We’ll start off the hike from a small village which name is Xizhazi, following a hillside trail to the Great Wall. About one hour later we will reach the Er Dao Bian Tower, which l is about 900 meters above the sea level. From there we will trek north on a steep and rocky section of the Wall, with a lot of scrambling and climbing. Then you will see the Nine-Eye Tower in the distance. The Nine-Eye Tower is the largest-scale watchtower of Great Wall in Ming Dynasty. It was an important command post during the ancient wars, measuring 7.8m high and 13m wide. It has three layers, and there are nine holes which look like nine eyes on each side. 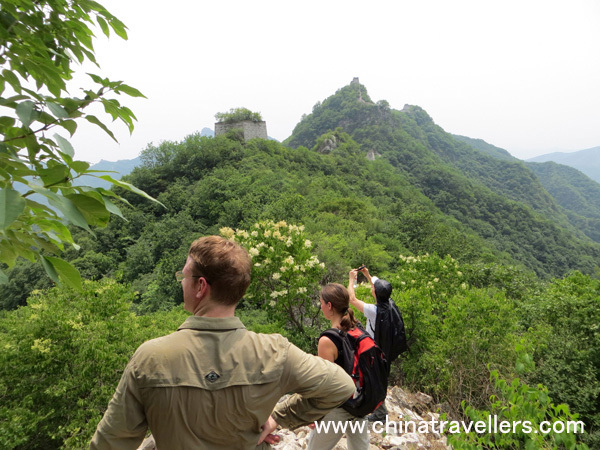 You will get a peak overlooking of the whole section of Jiankou Great Wall from the tower. From the Nine-Eye Tower we will head west, following the wall to an urn city monument that was built in Ming Dynasty. After that we will walk along a hill trail which will take us back to the Xizhazi village. We will have a late yet big lunch at a local farmer’s guest house after the hike.